A 17.3-inch laptop tested with Windows 10 Home, an Intel Core i3-6100U 2.3GHz processor, 4GB of memory, Intel HD Graphics 520 graphics, and a 500GB hard drive. 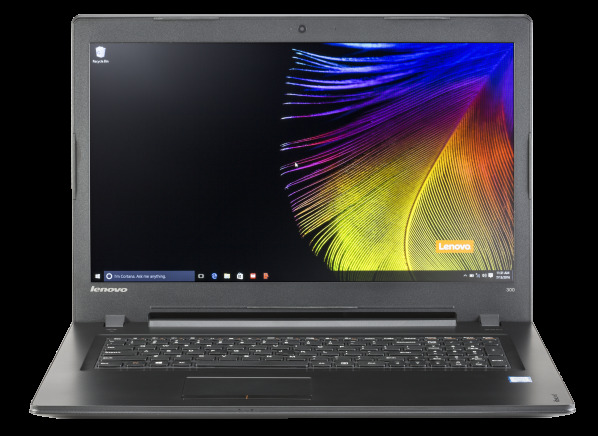 The Lenovo 300-17ISK 80QH008MUS is a 17.3-inch laptop with an LCD resolution of 1600 x 900. It has 4GB of memory and a 500GB hard drive. It has an Intel Core i3-6100U 2.3GHz processor and Intel HD Graphics 520 video adapter but no dedicated video memory. It comes with Windows 10 Home pre-installed. The 300-17ISK 80QH008MUS has a built-in memory card reader for digital photography, a multitouch touchpad, and 3 USB ports. It has HDMI out for connecting to an HDTV. You can use an 802.11n router, the most common high-speed standard or 802.11ac, with the latest, faster standard . The 300-17ISK 80QH008MUS measures 16.4 inches wide by 1.1 inches high by 11.5 inches deep and it weighs 5.8lbs. It's backed by a 12 month warranty, with 12 months of tech support. Results in the following chart are gathered from Consumer Reports’ 2018 Winter Survey of 36,919 laptops, owned by members who purchased a new device between 2013 and 2018. Our predicted reliability ratings are based on a statistical model that estimates problem rates within the first 3 years of ownership, for laptops that are not covered by an extended warranty or service contract. We also adjust for the median number of hours of use per week. The median in our survey was 15 hours per week. Higher ratings are indicative of better reliability. Brands receiving a red or orange rating cannot be recommended by CR at this time. Our owner satisfaction ratings are based on the proportion of members who are extremely likely to recommend their laptop to friends and family. WiFi type WiFi type The type of built-in 802.11 wireless networking supported. Computers with 802.11n also support 802.11g routers. Some models with 802.11n also support the 5GHz "high band," a standard suitable for apartments and other crowded areas. USB sleep and charge USB sleep and charge Unlike standard USB ports that power off when the computer is turned off or put to sleep, sleep and charge USB ports remain powered on when in sleep mode. They can be used to charge electronic devices such as smartphones and tablets. Thunderbolt port Thunderbolt port Has a Thunderbolt port for connecting peripherals such as an external hard drive. This includes ports that may be on the keyboard dock of detachable laptops. Thunderbolt is a high-speed port that can connect to DVI, HDMI and VGA through the use of adapters. Thunderbolt 3 is the newest version that supports faster speeds. Digital video out Digital video out Has an HDMI, DisplayPort, or Thunderbolt video output for sending a digital video signal to a computer monitor or HDTV. Number of USB ports Number of USB ports Number of USB ports for printers, flash drives, or other peripherals. This includes ports that may be on the keyboard dock of detachable laptops. Gigabit Ethernet Gigabit Ethernet Support for 1,000 Mb/s networking. HDMI output HDMI output An HDMI out port for sending a digital video/audio signal to a computer monitor or HDTV. DVI video out DVI video out A connection for an external digital flat-panel display. VGA video out VGA video out A connection for an external display with a VGA input. This includes ports that may be on the keyboard dock of detachable laptops. Blu-ray or DVD Blu-ray or DVD Has either a Blu-Ray drive (B), which lets you watch Blu-Ray movies and read/write to CDs and DVDs, or a DVD drive (D), which lets you read/write to CDs and DVDs. Facial recognition Facial recognition Webcam can be set to scan your face for secure log-in. Fingerprint reader Fingerprint reader A biometric fingerprint reader for logging into your PC. Hand gesture control Hand gesture control Hand gesture control allows you to use specific hand motions to control your computer. Depending on the software you can do things like raise and lower volume, scroll up and down, zoom in and out and open and close applications. Display size (in.) Display size The diagonal measure of the LCD (Liquid Crystal Display) screen. Operating system (as tested) Operating system (as tested) The operating system that was installed on the computer at the time it was tested. The operating system is the software that controls the basic operation of the computer. Common examples are Windows and Mac OS. The operating system determines the "look and feel" of the PC. Processor Processor Also known as the CPU (Central Processing Unit), the processor is responsible for running commands and handling data. Processors come in different speeds and may have two or more cores (ex. dual-core), which let you more quickly process multiple complex tasks. Memory (GB) Memory Also known as RAM, memory is a temporary storage area for data. Its size is an important factor for performance. We recommend at least 4GB of memory, or 8GB if you plan to run several large applications at the same time. Storage (GB) Storage The amount of storage, a permanent area for the operating system, programs and data such as documents, music, and media files. Storage can be a hard drive, an SSD (solid state drive), or hybrid drive. Video memory (MB) Video memory The amount of dedicated memory built into a graphics adapter. Most models have integrated graphics, which have no dedicated memory but are still suitable for most applications, including photo editing and watching movies. Others have discrete graphic adapters, which typically have 256 MB or more video memory, to deliver smoother and more realistic graphics for 3D games. LCD resolution LCD resolution The number of picture elements ("pixels") across the horizontal and vertical dimension of the screen. The higher the resolution within a given size screen, the finer the detail that can be displayed. Video adapter Video adapter Also known as the video card, the video adapter processes all the data that you see on your screen. They come in different speeds and may be integrated (most common, but is slower and uses up memory) or discrete (which is faster and has its own dedicated memory). If you will not be playing complex 3D games, any integrated graphics adapter will do. Otherwise, buy a discrete graphics adapter with a graphics processor from ATI or Nvidia with at least 256 MB of memory. Optical drive Optical drive The optical drive reads and/or writes to CDs and DVDs. Most PCs come equipped with a DVD-RW, also known as a DVD burner, which lets you read and write to DVDs.Some models come with Blu-Ray drives, which let you play high-definition movies. Height (in.) Height The height from the table, or thickness, of the computer while closed. This includes the keyboard dock on detachable laptops. Depth (in.) Depth The depth, from the front edge to the back hinge, of the computer while closed. This includes the keyboard dock for detachable laptops. Width (in.) Width The width of the computer while closed. This includes the keyboard dock of detachable laptops. Thin and light Thin and light Based on weight and thickness. This includes laptops that may be labeled "Ultrabook," "Sleekbook," "Thin and light," and "Ultrathin," among other terms. Warranty length (mos.) Warranty length The length in months of the manufacturer's standard warranty. Tech support length (mos.) Tech support length The length in months of the manufacturer's free technical support by telephone. Battery capacity (WHr) Battery capacity The total energy contained in the battery, expressed in Watt-hours. A larger capacity battery will deliver longer battery life, but will add weight and sometimes will extend beyond the edge of the laptop. EPEAT level EPEAT level EPEAT (Electronic Product Environment Assessment Tool) certification, based on environmental attributes such as the types of materials used and power consumption. There are three levels (in increasing order of environmental performance): bronze, silver, and gold. Products without an EPEAT level either do not meet EPEAT's minimum requirements or have not yet been tested by EPEAT.